By Venkatesh Nayak With the exception of the Vice President of the Indian National Congress (INC) who queued up before a bank branch in Delhi to exchange a small sum of the demonetised notes for new ones, people did not see any other political leader from any other political party queueing up before banks like them with money in hand and worries in their minds about the uncertain future. 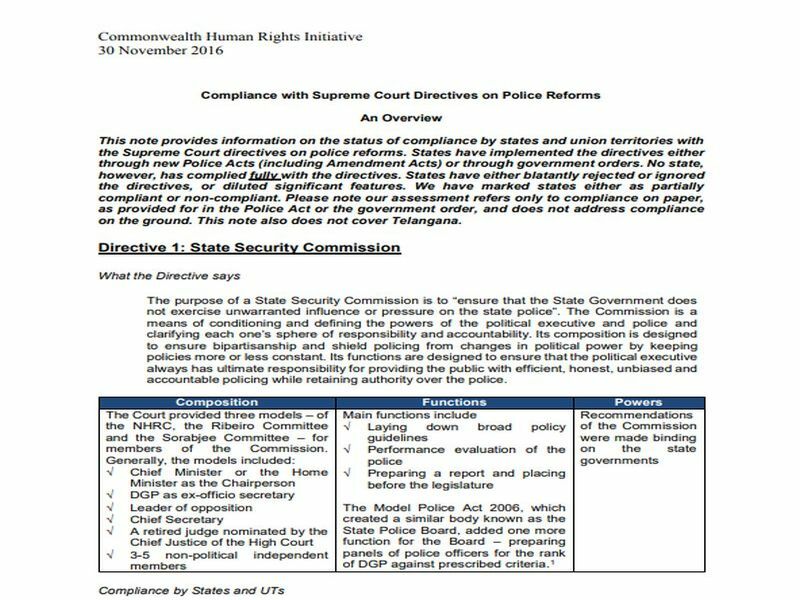 This note provides information on the status of compliance by states and union territories with the Supreme Court directives on police reforms, as of November 2016. 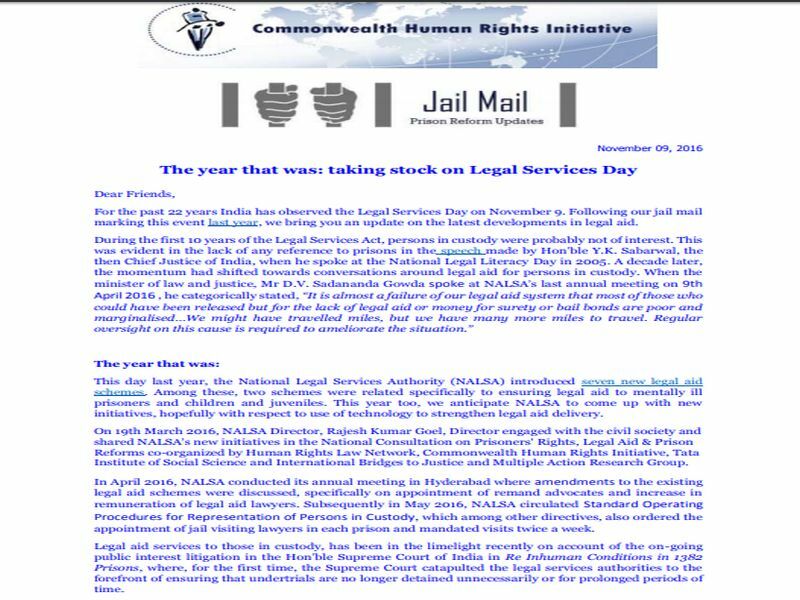 For the past 22 years India has observed the Legal Services Day on November 9. Following our jail mail marking this event last year, we bring you an update on the latest developments in legal aid. 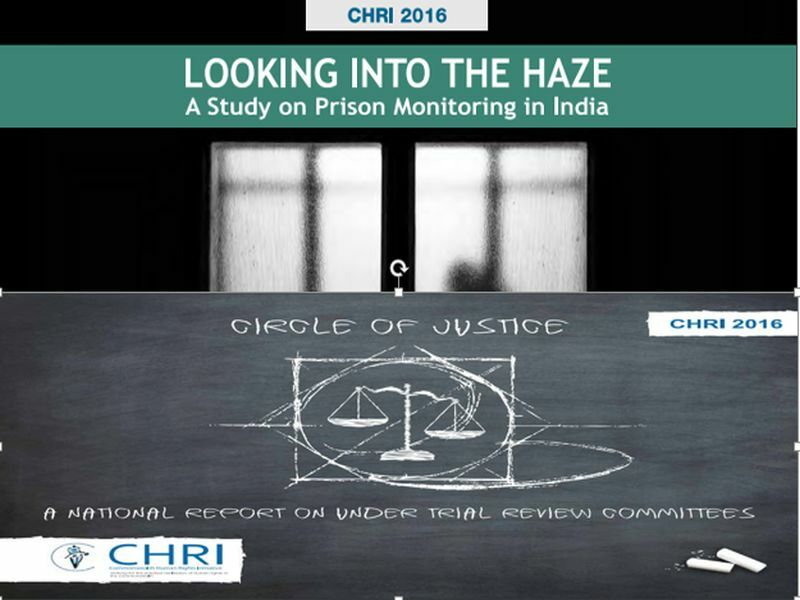 Looking into the Haze: A Study on Prison Monitoring in India is a must read for human rights activists and civil society organisations who care about a prisoner’s rights. The penal system in India is a closed institution that discourages independent monitoring leading to widespread abuse of legal and human rights among the jailed. The Commonwealth Human Rights Initiative’s new ground-breaking report: Circle of Justice: A National Report on Under Trial Review Committees throws a sharp light on the plight of undertrials in India. Undertrials make up an astounding 67 percent of India’s prison population. 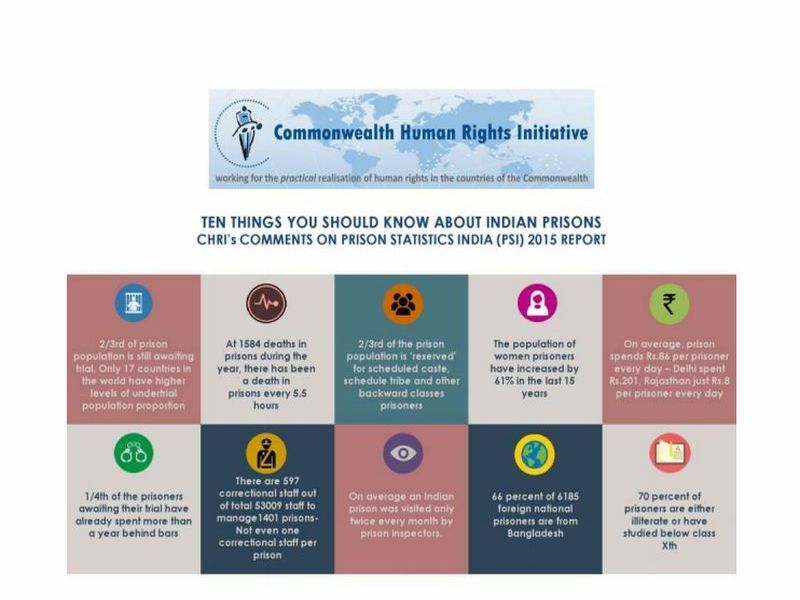 The Commonwealth Human Rights Initiative has launched a set of unique reports that spotlight the dismal conditions in India’s prisons. These reports underline how a lack of review has led to alarming conditions in jails–with a huge under-trial population of which a majority is poor. The National Crime Records Bureau (NCRB) has released its annual report on conditions in the country’s prisons. The Commonwealth Human Rights Initiative’s breakdown of the NCRB figures backed up by an incisive commentary is something you won’t see elsewhere.The figures and comments in Hindi are here. CHRI called on the Secretary-General, intergovernmental institutions, 52 member governments, and all Commonwealth Accredited Organisations to mark yesterday’s anniversary by committing to actively promoting and defending the values as laid out in the Harare Declaration and Commonwealth Charter. A few days ago the media reported yet another gruesome instance of murder of an RTI user in Mumbai. The Mumbai Police are said to have arrested two suspects including an ex-Corporator during their investigation of this incident. 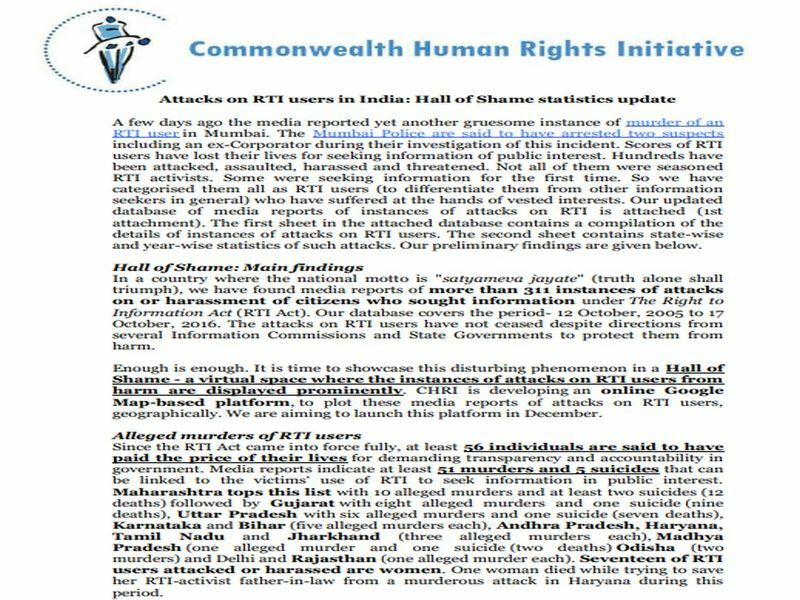 Scores of RTI users have lost their lives for seeking information of public interest. Hundreds have been attacked, assaulted, harassed and threatened. CHRI, in cooperation with Tanganyika Law Society (TLS), Commission for Human Rights and Good Governance (CHRAGG) and other members of Haki na Usalama Forum launched a position paper entitled "The Police and the Executive: Roles and Responsibilities" in Dar es Salaam, Tanzania.